I graduated from Faculty of Dentistry at the Medical Academy in Warsaw (1994). Since 1995 I have served as an assistant at the Central Clinical Hospital of the Military Medical Academy (WAM) in Warsaw. In 1997, I obtained the title of 1st degree specialist in general dentistry, which was followed by the title of 2nd degree specialist in periodontology in 2001. After the transformation of the Polyclinic at the Central Clinical Hospital of the Military Medical Academy (WAM) into SP ZOZ (health service institution), I work in the department of Oral Mucosa and Periodontium Diseases of the Dental Clinic in this unit. I authored and co-authored numerous publications, primarily revolving around the application of lasers in the treatment of mucosal and periodontal diseases. In 2010, I acquired the title of Doctor of Medical Sciences at the Medical University of Warsaw. 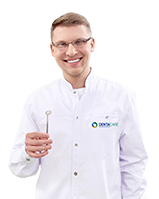 I have been working in the Denta Care Clinic in Bemowo since its foundation, taking care of a large number of patients. In my private life, I enjoy travels, cats and science-fiction. Thermographic assessment of the thermal effects of the Er:YAG laser in periodontological surgery. The conditions of dentition and periodontium in soldiers beginning their military service.